Student Mahmoud Sarhan put the images on Facebook after visiting Cairo's International Garden municipal park. A vet contacted by local news group Extranews.tv said that a zebra's snout is black, while its stripes are more consistent and parallel. 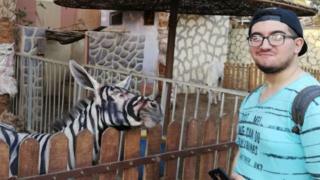 When contacted by local radio station Nogoum FM, zoo director Mohamed Sultan insisted the animal was not a fake.